The Guyana-Venezuela High Level Bilateral Commission met today at the International Conference Centre at Liliendaal to begin talks ahead of tomorrow’s state visit of Venezuela’s President Nicolas Maduro. Speaking on behalf of the Guyana delegation was Finance Minister Dr Ashni Singh, who told the media that the commission had a packed agenda set for the remainder of the day. 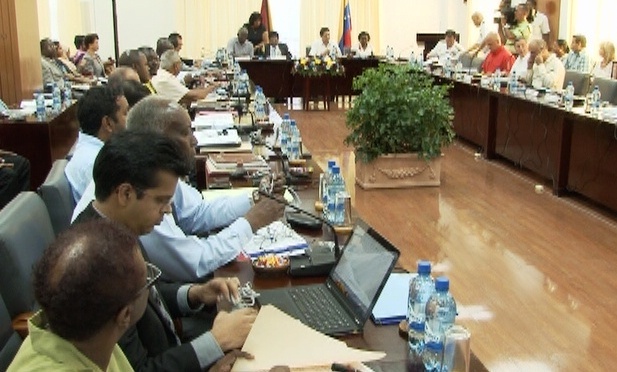 Also in Guyana’s delegation was Public Works Minister, Robeson Benn. Minister Singh extended a special welcome to the visiting delegation and spoke of the special relationship the two countries share. And he expressed the anticipation that tomorrow’s state visit would serve to further strengthen Guyana and Venezuela’s relationship.